Kiwanis Club came out to the Hospice House to hear Elise Boren speak about the Hospice House Foundation of WNC to the group. 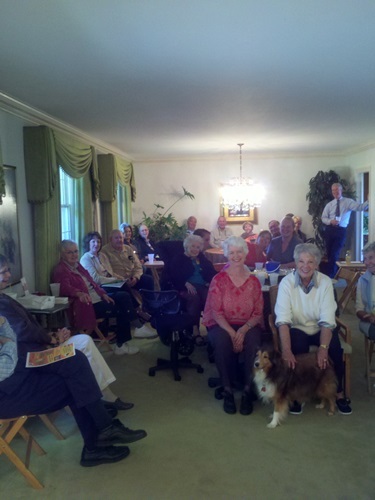 30 individuals came out to the house to have their lunch, tour the Hospice House, and have their meeting. Seeing the house allowed them to understand what the house will provide and where the addition will be built. They are excited to support the foundation and get involved. Truly a great group of people! The Hospice House Foundation of Western North Carolina (HHF) was founded in 2005 with the goal of building a sixbed facility that would allow patients a feeling of comfort while experiencing, in most cases, their final days of life. After many challenges that were presented along the way, those goals have become more attainable – from the purchase of the Dryman home located on Maple Street here in Franklin, to the Certificate of Need being awarded to the foundation, and now with a challenge grant being awarded in the sum of $1 million. After an appeal to NC Dept. of Health & Human Services by the Hospice House Foundation and Four Seasons, the Agency has found that the Proposed Project for a Hospice House conforms with all relevant statutory review criteria and has approved the Certificate of Need application to build the hospice facility in a way that ensures those in Western North Carolina who need any kind of hospice care (home based and facility based) will get it.